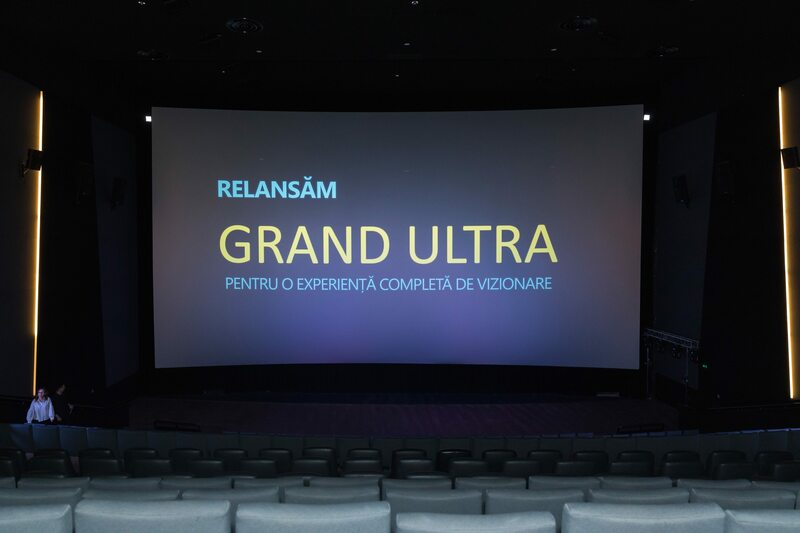 Bucharest, Romania (December 6, 2017) – Grand Cinema & More relaunches the most technologically-advanced cinema hall in Romania, Grand Ultra, thus redefining the ultimate viewing experience for cinemagoers. In addition to featuring the largest cinema screen and the only Dolby Atmos audio system in Romania, Grand Ultra now boasts the only Guitammer active seating system and the brightest image in the world, grace to the latest laser projector 4K RGB. Grand Ultra is an auditorium designed to offer a screening to the highest standards. Design elements, all the available equipment, from the audio and projection systems, to the distinct characteristics of the auditorium seats or the screen’s shape, size and texture, work together to perfect every cinematographic experience. For the first time in Romania, the Ultra auditorium is enabled with the latest projection technology – 4K RGB laser. With twice the brightness of any classic equipment, the new projector offers the clearest possible image, even brightness all over the screen’s surface, saturated and uniform colours and an increased contrast ratio. Each screening’s realism is also enhanced by the only Guitammer active seating system available in Romania, able to convert the low and very low frequencies in the movie soundtrack into vibrations that reproduce movement and impact. Grand Ultra is also equipped with the most advanced audio system available in the world – Dolby Atmos. In Romania, the Atmos platform is only available at Grand Cinema & More, bringing a fundamental change in how film sound is created. A total of 52 speakers are displayed on the ceiling and the side walls, allowing up to 128 independent audio objects not only to be precisely placed in the auditorium, but also have their movement reproduced according to the movie action. “Thank to the latest technological updates, Grand Cinema & More now holds the most advanced cinema hall in Romania. From the very beginning, the Grand Ultra auditorium has been designed as the ultimate screening room, each and every upgrade that followed adding to the experience. We are glad that this auditorium now meets the highest standards in Romania and in the world in terms of sound and image quality, able to make the most of every cinema experience”, stated John Younis, Entertainment Business Unit General Manager. All these upgrades add to the auditorium’s “Black Box” design and to the largest silver screen available in the country, as wide as 22,5m and as high as 13m. This way, the ceiling, side walls and seats are dark coloured, so nothing distracts viewers from the movie action, and the screen’s texture and concave shape not only offer a better visibility, but also improve image quality. Grand Ultra auditorium seats up to 480 people, being the ideal destination for movie enthusiasts in search of impressive cinematographic experience, brought to life by movies such as “Murder on the Orient Express”, “Justice League”, “Star Wars: The Last Jedi”. Grand Cinema & More covers a surface of over 14 000sqm and has a full capacity of 2 600 seats, displayed in 13 auditoriums enabled with the latest technology and comfortable seats, for screenings that meet every movie lover’s expectations. Grand Cinema & More is more than just a cinema. Apart from quality movies and cutting edge sound and projection technology, it is the only Romanian cinema to have developed a cultural events stage, holding either original productions or live transmission of some of the world’s most appreciated shows, among which theatre shows, opera, ballet, improvisation and special events. More information regarding the cinema programme is available at www.grandentertainment.ro and on the official Grand Entertainment Facebook page www.facebook.com/GrandCinemaDigiplex.